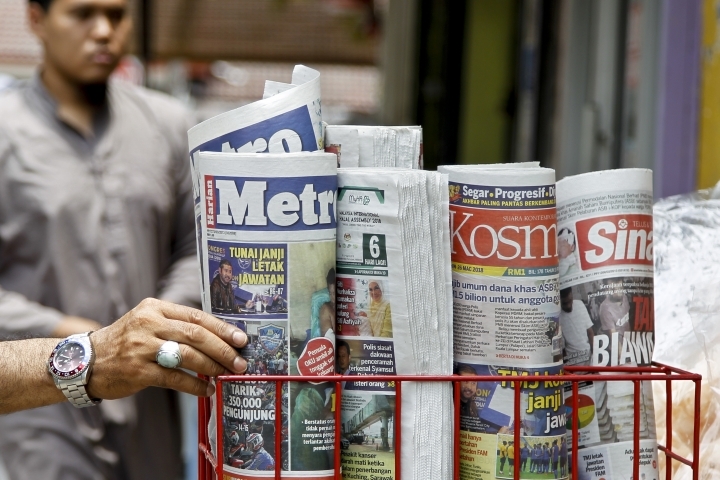 KUALA LUMPUR, Malaysia — Malaysia's government proposed new legislation Monday to outlaw fake news and punish offenders with a 10-year jail sentence, a move slammed as an attempt to silence dissent ahead of a general election. The bill defines fake news as "any news, information, data and reports which is, or are, wholly or partly false whether in the form of features, visuals or audio recordings or in any other form capable of suggesting words or ideas." It covers all media and extends to even foreigners outside Malaysia as long as Malaysia or its citizens are affected. "This is an attack on the press and an attempt to instill fear among the (people)" before the general election, opposition lawmaker Ong Kian Ming tweeted. Support for Najib's ruling coalition has dwindled in the last two elections. In 2013, it lost the popular vote for the first time to the opposition. Yet analysts say Najib is expected to win a third term due to infighting in the opposition, unfavorable electoral boundary changes and strong support for the government among rural ethnic Malays. "Malaysia has a long and troubling track record of using its legal books to silence dissent," James Gomez, Amnesty International's director for Southeast Asia and the Pacific, said in a statement. "It is no coincidence that this law has been tabled with general elections just around the corner. We are already seeing how the government is closing the space for public debate ahead of the polls."